Is Jon Huntsman headed the way of Charlie Crist? When the 2016 Dem convention rolls around, will we see the also-ran GOP presidential nomination-seeker on the podium, seconding Hillary's nomination? You've got to wonder after Huntsman's toadying performance today as he made the MSNBC rounds. 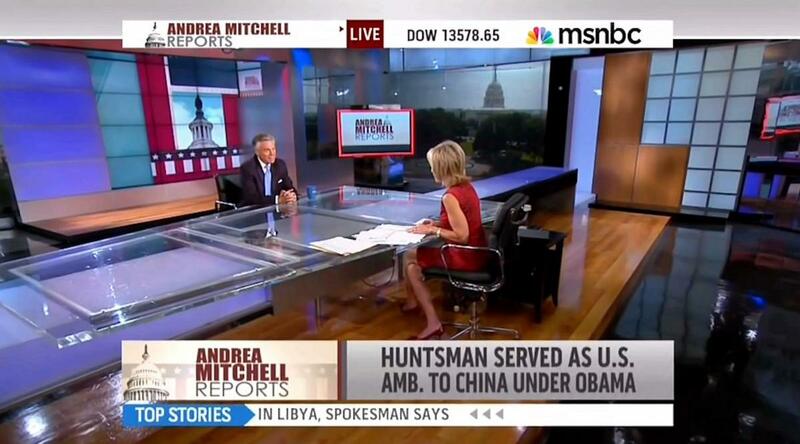 After appearing on Morning Joe earlier, Huntsman turned up on Andrea Mitchell's show. Mitchell posed a laughably-loaded question, bashing Mitt Romney's response to the Obama administration's handling of the embassy attacks. The haughty Huntsman was only too happy to play the useful idiot, concurring that there was "a lot to the criticism" and ripping Romney as an "impetuous candidate" in a time of foreign policy crisis. View the video after the jump. How this supercilious specimen ever thought he had a chance at the Republican nomination is an open question. In the meantime, watch his faux-gravitas performance as he proves the principle that the Republicans MSNBC loves best are those willing to bash fellow members of their party. And chuckle at Mitchell's set-up, as she poses a hilariously loaded, Romney-bashing, "question". ANDREA MITCHELL: Let's talk about, first of all, Mitt Romney's initial response [to the consulate attack in Libya]. The State Department has not identified what has happened to a missing ambassador. They don't know, they know one person is dead, they don't have the identification, they're trying to reach next-of-kin. A complete scramble. At 10 o'clock Eastern time, I'm sitting here at NBC, trying to talk to State Department officials. Libyans are reporting, Libyan officials are reporting, that the US ambassador, first of all that a diplomat has died; it could be the US ambassador. And Mitt Romney comes out with a statement attacking the administration for a press officer's statement in Cairo. Good? Bad? Good judgement? JON HUNTSMAN: Well, Andrea, it's been replayed a thousand times and I don't have anything to add to the critique. I think there's a lot to the criticism. But I would tell you this: Americans don't want an impetuous candidate during a time of international upheaval and a foreign policy crisis. And you have an opportunity to teach, to lift, to inspire and to articulate America's goal in the region. And then if you get it wrong you can always redo it the next day when you're given a press availability. And that was not to be.